Beakers are one of the most oft-used pieces of equipment in the laboratory. At the most basic level, beakers can hold samples of whatever you’re studying. As they come in different sizes, they can be used for a multitude of other functions, such as preserving a small chemical reaction. Experiments that result in a liquid product utilize beakers to catch the liquid. Beakers are also used in experiments involving chromatography and are widely used in research, education, and industry. In the past, beakers were made of glass. In recent times, new and different types of plastics have carved out a niche for themselves in the laboratory. The increasing use of automation in the lab has reduced the role of glass products in many laboratories. Nowadays, depending on the amount of chemical and heat resistance required, beakers are made from borosilicate glass such as Pyrex, platinum, plastic, and even paper. The need of scientists for glassware has reduced due to the introduction of single-use, unbreakable, disposable plastic items such as plastic pipettes, tubes, and beakers. Plastic has a distinct advantage over glass in that it is not as breakable or fragile. Glass laboratory items often get broken while being washed and prepared for use. But it is even more critical when glass breaks during an experiment that might expose users to biological, radioactive, or carcinogenic hazards. Plastic is not without its problems, though. Some types of plastic might dissolve on contact with some solvents. Some kinds are permeable to gases so that material inside the beaker could oxidize or undergo pH changes. This is when a glass alternative is chosen. Plastic is a great deal less expensive than glass, and plastic laboratory equipment such as beakers can simply be thrown out instead of having to be carefully washed. Besides, plastic can be squeezed and manipulated, unlike glass. In recent years, plastic development has grown by leaps and bounds. Plastics have been developed that have many of the qualities valued in the glass. As an example, polymethylpentene is an exceptionally clear plastic that has optical qualities almost identical to glass. It can also be autoclaved for sterilization and reuse. In terms of the history of plastic use in the lab, around 40 years ago, the Nalge Company of New York made the first plastic pipette jar. The company’s founder found that people were complaining that when they dropped a glass pipette into the traditional stainless-steel storage jar, the tip broke. To eradicate the problem, he welded plastic bottoms to pieces of plastic piping. Subsequently, the company began manufacturing many plastic products designed to deal with the problem of glass breakage. One of their first products was plastic beakers. According to experts, the demand for plastic equipment in the laboratory is growing fast, especially in the life science market. For example, some new plastics have been designed for use in cell biology laboratories. These plastics are even more inert than glass and prevent cells from adhering to the surface of the equipment. Still, other plastic surfaces can be treated to cause cells to stick to them and merge to form a confluent layer more quickly than they would on glass. In fact, plastic technology continues to evolve, offering clients more products for specific needs. These days, manufacturers are making specific types of plastic products for specific requirements, offering advantages over glass and other kinds of plastic. Beakers are also made from fluoropolymer, or Teflon, a type of plastic that we know as a coating for some kinds of cookware. Teflon is particularly useful for handling hydrofluoric acid, which eats through glass and other plastics. There is also concern about our ‘disposable world’ problem so that some experts are advocating the reuse of even single-use, disposable plastic items in the laboratory. Plastic labware is quickly becoming extremely popular due to its durability and affordability. Choose plastic products on the basis of sterilization requirements, temperature exposure, and chemical compatibility. Products chosen should also contain the lowest amounts of additives as possible. These include stabilizing additives to render plastic moldable, especially antioxidants and heat stabilizers to prevent the product from breaking down during molding. 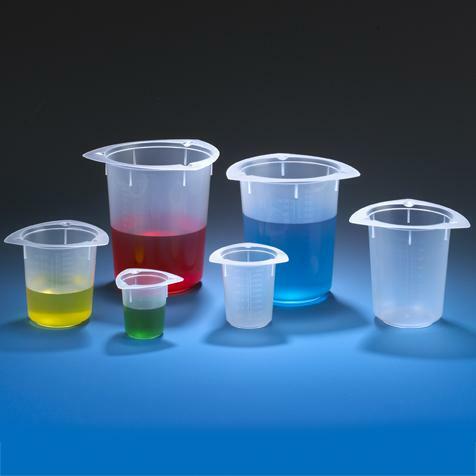 When choosing plastic labware, the benefits of any additives should be considered against the risk of leaching and the contamination of laboratory solutions. Generally, the fewer additives, the better for high-quality, laboratory-grade plastics. The quality of the plastic resin used to produce the laboratory products is reflected by the cost of the products. In other words, you get what you pay for. But when you’re dealing with precious samples, you need to be sure that your plastic labware comes from a reputable manufacturer. Even if it is quite pricey, you can be sure it is cheaper than the glass version of the same thing.